The City of Fountain Valley, California reached their 50th anniversary in 2007 and designated the entire month of June to celebrations. 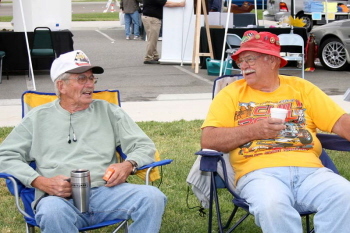 A car and truck show honoring this event was held at Mile Square Park and over 400 cars showed up to participate. The city asked Pete Haak to organize this event and he in turn contacted various clubs to help out. At the entrance was Bill Lee from Pickups Limited. He said that his club has been involved in various car shows like Western Nationals and on June 23rd they will be exhibiting their cars at Featherly Park in Anaheim, California. Ted Thompson was another volunteer. He was also a member of Pickups Limited. Michelle Jensen and Shelley Haak were working in the T-shirt tent and assisting with registration. Pete Haak, the man in charge, was busy running here and there getting things organized, but on the run he managed to give a few comments. 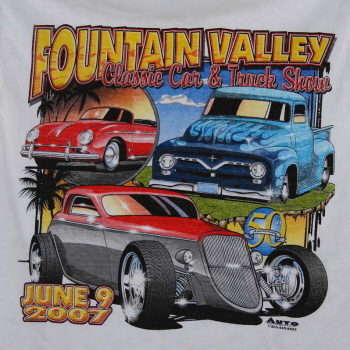 “We’ve been planning this car show with the City of Fountain Valley for over a year,” he said. Haak is a member of two Porsche Club, Hot Rod Associates and Pickups Limited. Roger Jensen added that the city put out an announcement for help and many people volunteered. The event was located on the lawn of the soccer fields next to the Boy’s and Girl’s Club building. Parking was close, vendors had all sorts of products to show and sell and the Kiwanis Club held an early morning pancake breakfast. Gus Ayer, the mayor of Fountain Valley was helping in one of the booths. Gus could pass for a linebacker and had a gruff but grandfatherly demeanor. He was very proud of the residents of the city who came together to help put on this show. A week later the city plans on a huge fireworks show at Mile Square Park, not far from where the car show was. Another happy person was Beverly White, who is the Executive Director for the Chamber of Commerce. Two redcoats (volunteers) were Marcia Bruno and Autumn Schabert from RACES (Radio Amateur Communications Emergency Services). They are ham radio operators who volunteer to help cities and towns around the country in providing emergency radio contact in case of disasters. Their group of 25 volunteers meet at the Fountain Valley Police Department and organize emergency drills. Such ham radio groups exist throughout the world and their help is extremely valuable in getting word in and out of disaster areas. Today they were on hand to help coordinate the communications for the car show. “We have a national show in Dayton, Ohio in April and a huge drill in Orange County in October,” said Marcia. Local resident and racing team owner, Ken Hillberg brought two midget and two sprint cars. Hillberg is active in sprint car racing and owns a very valuable collection of old-time racecars, one of which was driven by legendary driver Billy Vukovich. George Hamilton came to help Hillberg. Hamilton was sporting a URA (United Racing Association) cap. Quite a few motorsport racers call Fountain Valley, California their home. 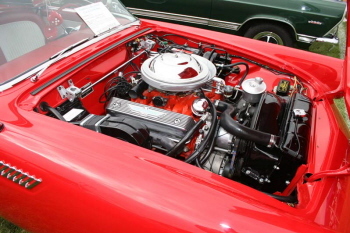 Roger Rohrdanz covers hundreds of car shows and he said, “the variety of this car show was outstanding.” There were muscle cars, classic roadsters and coupes. We passed a Graham, an Isetta and a few cars that we hadn’t seen before. Robert Lee is the West Coast Event Coordinator for the ’57 Fords International and he had his car on display. When asked about why people should pick out a year instead of a model, he explained. 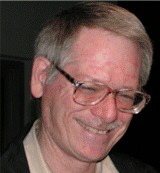 “That was a unique year and a unique car and many of us had ’57 Fords in high school,” Bob said. “They outsold Chevy’s that year and they ruled the race track with their big 312 c.i. engines. Nothing could take them on the track or the streets,” Lee added. 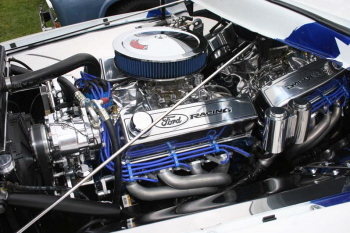 There are two websites for the ’57 Fords International; www.57FordsForever.com and www.1957Ford.com. 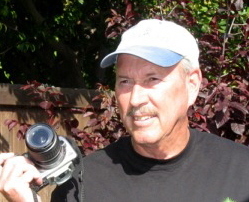 Rick Crawford is a member of the ’57 Fords International and a former drag racer who raced at Lions, Orange County Raceway and Irwindale in the 1960’s. Courtney Hansen was another displayer and member of the ’57 Fords. He told me that the club shows their cars at the Seal Beach, Knotts Berry Farm, Belmont Shores and La Palma Park car shows. On October 19-21, 2007 they will be at the California Speedway Car Show in Fontana, California. This show wasn’t all Fords though. Eugene Bamsay exhibited a nice ’37 Chevy Sedan. Billy George brought his ’56 Olds Rocket 88. Bill and Sandi Nemecek drove their ’41 Willys to the show. William Hufnagel came in his ’65 Cobra replica car. Richard Balty showed up in his ’68 Dodge Dart convertible. Robert Grim was there with his ’56 Chevy stationwagon with a deep cherry red paint job. Ken Nefroney exhibited his ’57 Chevy Bel Air with a near original lime yellow ‘Colonial Cr�me’ paint job. “It’s all stock and yes there is a tinge of green in the color,” he said. Nefroney and his friends did four car shows in one weekend. 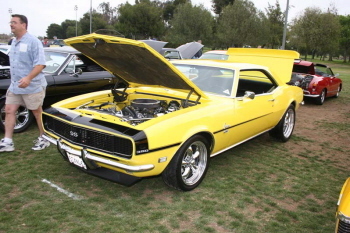 They were at the Huntington Beach Concourse, Bellflower, Newport Harbor High School and Featherly Park car shows. "I get my schedule of car shows from DRIVE Magazine, Automotive Calendar of Events and flyers that people leave in my car,” Nefroney added. Mike Ryan brought his ’63 Chevy Nova and it was apparent that Fords were not the only cars on display. Robert Pendleton drove in with his ’62 Rambler American 400 and a 3-foot toy car, both painted cherry red. Jack Beers displayed his ’29 Ford Coupe with the standard Ford green body and black fenders. Josef Czikmantory came in his 1975 Trabant P-601. This was a European car built by the Communists to compete with cheaper Asian and American models. The car looked extremely fragile and you don’t see a lot of them in circulation. 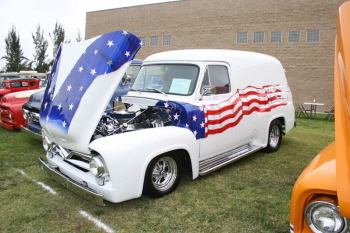 Antonio Villasenor brought his ’63 Ford Econoline, painted cobalt blue with the back removed to create a flatbed. Geoff McKay came in his right-hand drive ’32 Ford Cabriolet with a rumble seat constructed in South America. Jordan Cavanaugh exhibited his ’66 Austin Cooper, painted slate blue with a #2 painted on the doors. This car seemed half the size of the diminutive Trabant, but it still had 4 seats. Robert Miner drove his ’53 MGTD roadster painted black cherry pearl. 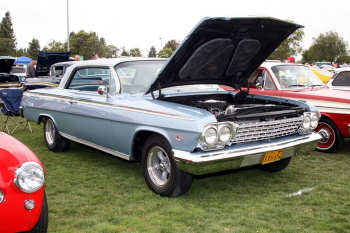 Borje Forslund, a local resident with a strong Scandinavian accent, displayed his ’58 Olds 98. “The car just came from Sweden a few days ago,” he said. “Someone on the boat hit the kill switch and tossed my keys. I had to hot-wire my car to get it here,” Forslund added. The car was a golden brown with chrome trim and stock, just the way 50’s cars were built. The previous owner had kept it in excellent condition but it was no easy matter to get it out of the country. “Europeans don’t like to sell their American cars to outsiders once they get these gems into their countries,” said Forslund. It probably helped that his accent was strong and so was his desire for beautiful cars. 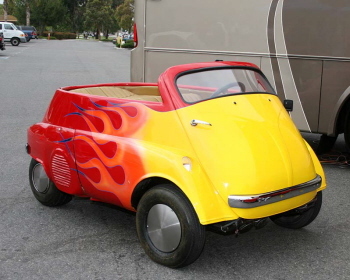 He had been searching for a model like this for 15 years to add to his car collection of 6 other choice automobiles. Forslund attends about 30 car shows a year, driving one of his special cars. 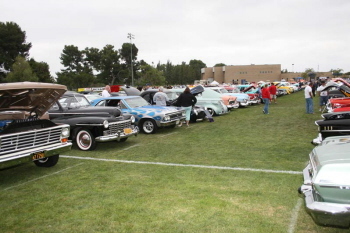 The Fountain Valley Classic Car & Truck Show may be a one-time affair, or the volunteers and the city may make this an annual affair. As car shows go, this one was smaller but cozier and the background scenery of the park and the large variety of cars, made this show special. Gone Racin’ is at [email protected]. The organizers didn’t expect the turn out they got. Nice surprise! Gil Palmer’s 406 cu in Chevy powered ’68 Chevy Camaro RS SS stands out from the several others on hand. “Pickups Limited” brought a very nice group of their club members trucks. They performed the Host Club duties at the event. 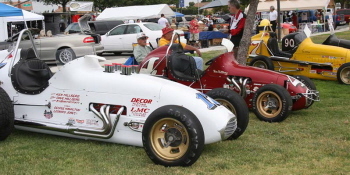 Ken Hillberg brought out a nice collection of his vintage midget and sprint race cars. – Ken Hillberg ( r) & George Hamilton do a little “bench racin’”. 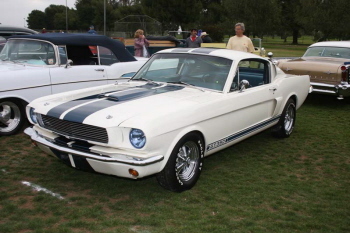 This clean ’65 Ford Mustang GT350 belongs to Terry Berzenye of Huntington Beach, CA. You don’t see many of these! In 1957 this was BMW’s answer to personal transportation. This one has had it’s roof removed and the engine is now a Honda. The owner is Chad March of Fountain Valley, CA. How about a Chevy in a Chevy! 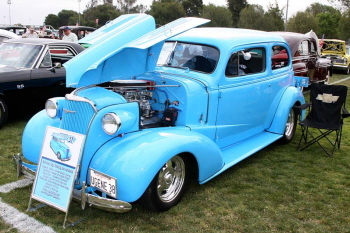 Here is Eugene Bamsey’s blown small block powered ’37 Chevy Sedan. 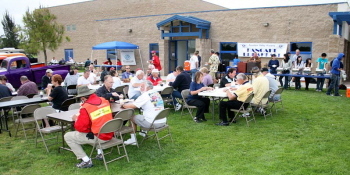 The well done Pancake Breakfast was put on by the Fountain Valley Kiwanis Club. The banner celebrating the reason for the car show. Fountain Valley’s Fiftieth Anniversery! All the participants got an event T-shirt. This show has some variety. 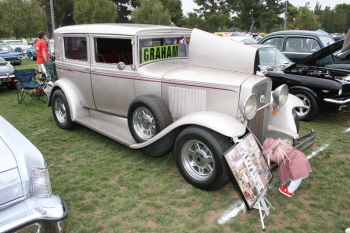 How about this ’31 Graham. Thank Steve Pavich for bringing it. 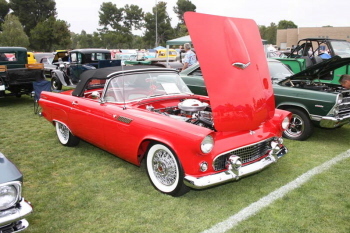 Richard Bojorklund of Anahiem, CA has owned this beautiful ’55 Ford T-bird with the original 292 Ford motor since 1972. 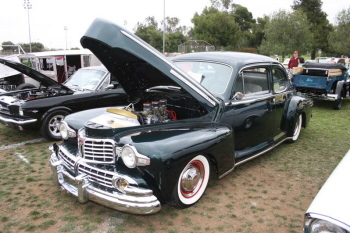 What do you think Don & Joyce Hodson decided to power their ’47 Lincoln Club Coupe with, naturally a 394 cu in Oldsmobile? 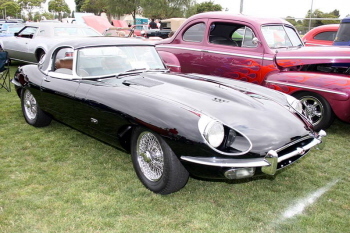 This fine example of a ’70 Jaguar XKE was brought by Mark Eichert of Fountian Valley, CA. We loved our chrome in the mid-50’s thru the mid-60’s. 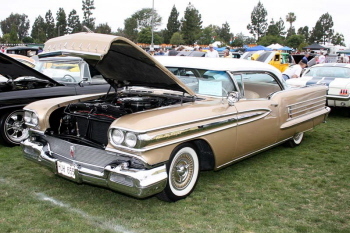 This ’58 Oldsmobile 98 is an excellent example owned by Borje Forslund. 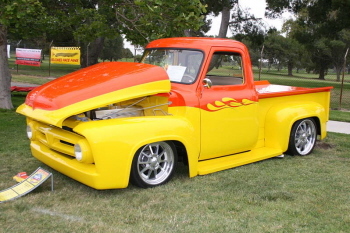 Mike and Linda Chaffers brought their beautifully crafted ’54 Ford F-100. Wow! This ’55 Ford F-100 Panel really stands out in a crowd. Dan Cangro did a nice job with the graphics and the engine.